Bless your bun with our new Dirty Burger Sauce, available exclusively at Morrisons. The very same sauce that is used on all burgers at the church of true barbecue. 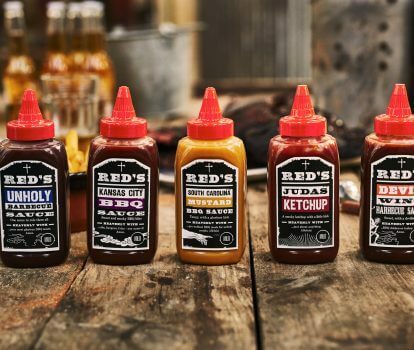 Red’s authentic BBQ flavour, blessed with habanero chilli. Dip anything that needs heat – use it in your cooking, add to chilli or fish tacos. If you dare. Exclusive to Tesco. You asked. Red delivered. Red’s Buffalo sauce, now available for home worship – slather over wings or bless tacos, potato skins or even mac-n-cheese. Exclusive to Tesco. This sweet, smoky, BBQ bliss is a traditional tomato-based Kansas City recipe, with sweet molasses, and a few spices to add a mild kick. Mop it. Slop it. Love it. 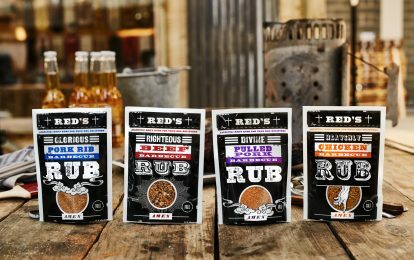 Slather it over your pork ribs, add it to your cooking, or use as a dipper with just about anything. Praise be! This is pure ‘Carolina Gold’, an authentic mustard-based recipe from South Carolina. It blends sweetness with vinegar and mustard to create a tangy BBQ sauce perfect for pulled pork and beef. Use it in your cooking or to smarten up your salads. There is one secret recipe to rule them all, and it’s Unholy. This is a Red’s restaurant favourite. Baptise your meat with this Mid Western-style sweet, rich, tomato-based sauce with added flavours of orange and fennel. Mix it with your mince or use it as base to your cooking. Amen to the dark side. Conjured by Lucifer himself, get ready to add a devilish twist and a kick to your chicken, turkey or burger mince. It’s sweet, smoky and hot, hot, hot.